In this article we will take a look at pool enclosures, their benefits and the different types that are available. The benefits of a pool enclosure. A pool enclosure is generally a transparent structure that sits or slides over your pool protecting it from the elements, keeping in the warmth and extending the use you can get from your pool to potentially year-round enjoyment. A swimming pool enclosure extends your pool season, it traps the heat from the sun and the heated water and ensures much less goes to waste and it makes pool maintenance easier and cheaper. The enclosure means that your pool is much less likely to get damaged by frost over the winter months and it goes some way to making accidents less likely. A low profile enclosure sits snugly over your pool and provides protection and insulation, but a high profile enclosure can give you a whole new, year-round garden room with a clean and warm swimming pool at its centre. On warm, sunny days the enclosures simply roll or slide back and allow you to enjoy swimming al fresco. What types of pool enclosure are there? Pool enclosures are available in a number of different types. Telescopic pool enclosures are built in sections that slide back into each other so that the pool can either be fully enclosed or almost completely open to the air. Air dome enclosures are rather like a large inflatable bubble and are similar in principle to the inflatable covers that sometimes sit over tennis courts. Static enclosures are permanently in place but do have opening roof panels. They are generally designed for small pools and even hot tubs or spas. For awkward installations or an individual look, there are bespoke, custom-built enclosures that, of course, come with an appropriate price tag. 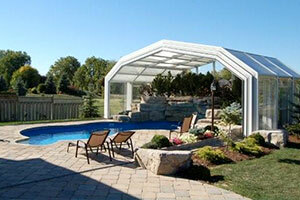 Probably the most popular form of pool enclosure is the telescopic type. Telescopic pool enclosures allow you to use your pool either completely under cover or fully open to the air and changing between the two options is a relatively quick and easy process; the cover just slides back to one end of the pool telescoping in on itself as it does so. Low enclosures sit only a few feet above the surface of your pool. They won’t dominate a garden or obscure a view but they do still allow you to use the pool even when they are fully closed. Like most telescopic enclosures, they are made from a powder coated aluminium structure that is glazed with polycarbonate panels. The glazing panels have UV protection and provide insulation. Low enclosures fit snugly to the side of the pool and run on either rails or wheels that sit on the paving at the poolside. High-sided pool enclosures create a large usable space that can be considerably larger than the pool itself giving plenty of space for lounging by the pool as well as swimming no matter what the weather. Their extra weight means that these spacious, glazed halls move on tracks laid by the pool. Once again, aluminium and polycarbonate are the main construction materials. Between the two there are enclosures that have a highest point of 7 or 8 feet above the centre of the pool but are often arched in construction so that the headroom at the sides of the pool can be rather limited. The air dome enclosure is an alternative to the telescopic variety. Air domes are large inflatable covers that are fitted over the pool. They take quite a while to attach or remove and so are generally fitted when the weather becomes poorer and then left in place till the following summer. The air dome enclosures are kept inflated by a small fan that uses about as much power as a 100W light bulb. The entrance to the air dome is through a zippered door in order to keep the structure airtight and inflated. A pool enclosure will certainly extend the use you get from your swimming pool and can either be quite discreet in their low-level form or provide a whole new space that is a real feature on your property should you choose the higher sided option. There is a contact button at the top of this article that can get that process started.